America's Rise to Dominance in the Middle East. When Michael Doran of the Hudson Institute told me he's writing a book on President Dwight D. Eisenhower's Middle East policy, I nodded politely, wondering why someone engaged in current policy issues would devote himself to a topic of mainly antiquarian interest. 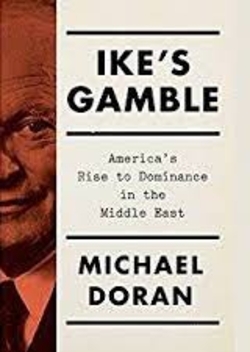 Well, having now read Ike's Gamble, I know the answer: his topic is both fascinating in itself and has continuing relevance for U.S. foreign policy. Gamal Abdel Nasser came to power about the same time in Egypt as Eisenhower and, as the leader of pan-Arab nationalism, dominated the Middle East during the president's entire eight-years in office. In light of their intense competition with the Soviet Union, American leaders had a choice of two basic approaches to Nasser: build him up to win him over or treat him as an opponent to reduce his influence. Focused primarily on finding allies against Moscow, Eisenhower and his secretary of state, John Foster Dulles, decided to woo Nasser; that's the gamble of the title. Doran follows this implausible effort in painful but nearly novelistic detail, revealing the full extent of its faulty premises, tactical blunders, and strategic errors. In brief, American support turned Nasser into the dictator of Egypt, wildly popular pan-Arab nationalist hero, invaluable Soviet ally, and global anti-American chieftain. Finally, in 1958, after the particularly bruising Suez War experience, the realist core in Eisenhower and Dulles wised up. I found Ike's Gamble a page-turner in part because it's fluently written but mostly because its tale so precisely foreshadows the equally misguided Middle East policy of Barack Obama and John Kerry. Iran succeeded Egypt as the region's cynosure; the Joint Comprehensive Plan of Action serves as the functional equivalent of the Suez War – a enormous, gratuitous victory handed by a clueless American president to a known enemy in the forlorn attempt to woo him. In Yogi Berra's reputed phrase, it's "déjà vu all over again." The 1950s consequences were bad enough – a rampant Nasser stirring trouble in Syria, Iraq, Yemen, against Israel, and beyond until his early death in 1970 – but the current error could have far worse implications: I mean, agreeing that an apocalyptically-minded regime acquire nuclear weapons? Thanks to Doran, we learn how appeasement constantly tempts American policymakers, even the hardest-headed of them. Forewarned is forearmed.